Below is an article written by Alex Grant, a member of the Longmeadow Select Board who submitted these articles explaining his position. Adam Lanza used a Bushmaster AR-15 assault weapon against children who were between the ages of six and seven. Thirty-nine months later, they would be turning 10, on their way to adolescence. The kids who entertained themselves in December 2012 with Dora the Explorer would be reading Harry Potter now, imagining themselves as wizards on their way to Hogwarts boarding school. There will be no Hogwarts nor any other school for them now. What if the dead could speak to the living? What would Charlotte Bacon, then six years old, and Daniel Barden, then seven years old, say to us? What would Rachel Davino, then 29 years old and devoting her professional life to working with autistic kids, say? If those once-hopeful souls wanted to believe that their deaths had made a difference, if they had represented some sacrifice toward a greater good, what would we say? If we were honest, we would have to say that precious little has changed for the better. Rather than coming together to reduce gun violence, there has been a surge in applications for gun licenses in the United States, in Massachusetts, and in Longmeadow. 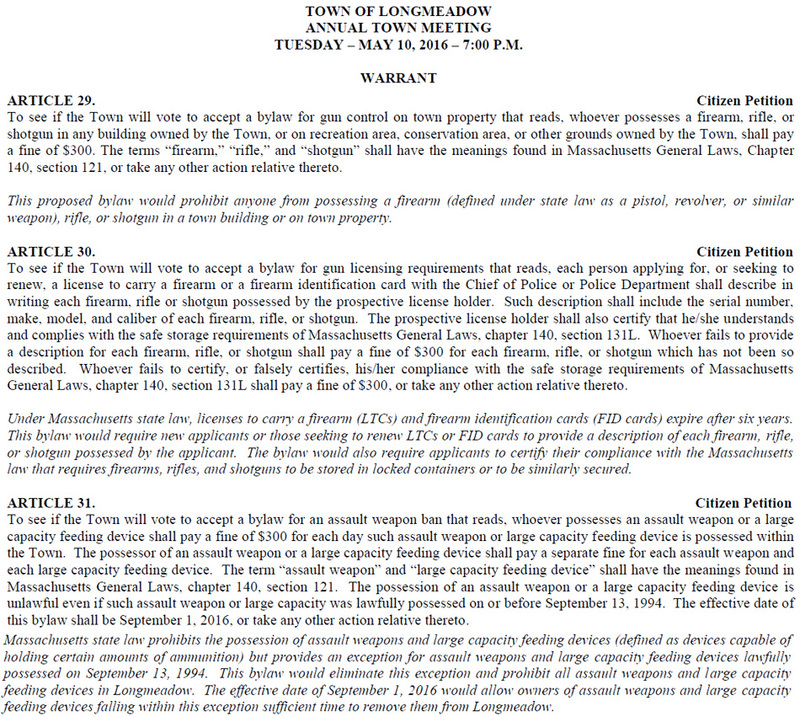 In fact, the numbers of Licenses to Carry (LTCs) have increased 25% in Longmeadow since Sandy Hook. For our kids, all we can offer are more lockdown drills. 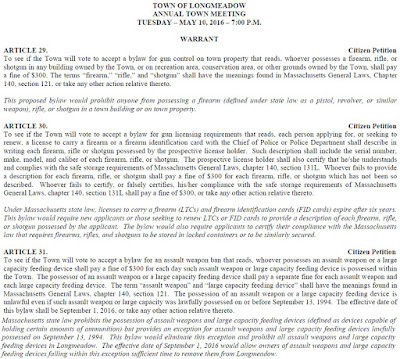 On May 10, voters at Town Meeting have a chance to make Longmeadow safer and to advance the debate about gun control beyond paranoia and misinformation. The three gun control bylaws which I have proposed as citizen petitions represent reasonable regulations that will make mass shootings and ordinary shootings less likely. Another bylaw would require license holders to provide a description of their guns and to certify their compliance with the state law requiring safe storage of firearms when they obtain or renew their licenses. This occurs every six years, and it is less onerous than our annual registration for dogs. With this information, police will better be able to keep track of lost, stolen, or transferred firearms. Moreover, they will know what kind of arsenal they are facing when they respond to emergency calls at a home. Finally, the certification will remind and reinforce the obligation gun owners have under state law for keeping their guns under lock and key. This will help to prevent accidental shootings and access to guns by children. The third bylaw would bar guns from town buildings and town-owned property, much like state law already prohibits guns from schools and universities. The bylaw would protect places like Greenwood Center, which houses a daycare facility for infants, toddlers, and pre-schoolers, as well as programs for the elderly. It would keep guns away from the Green on Longmeadow Days and away from youth soccer games in places like Wolf Swamp fields. It would not apply to sidewalks where residents own the land and the town only has a right of way. When we truly care about keeping a public place safe, guns are in the hands of trained police and military officers and nobody else. At airports and courthouses, guns are not allowed because we know that is the best way to keep those places safe. In those places, we do not imagine that having some percentage of the public armed is a way to thwart bad guys with guns. Gun owners may make the individual choice to possess guns in the event they want to use them to defend their homes. But as taxpayers who own and maintain town buildings and town property, it is our collective choice on how to secure these places. And why shouldn’t we strive to make Greenwood Center as safe as a courthouse? These bylaws are not a complete solution to gun violence in America. The debate over gun control is paralyzed at the national level and even at the state level. But in a Town Meeting form of government, we are not helpless, we are legislators, and we are called, as Theodore Roosevelt once said, to “Do what you can, with what you have, where you are.” In this time and place, we can make the next mass shooting, the next accidental shooting, the next suicide less likely, and we can serve as an example for other towns which want to do the same. Alex J. Grant is a member of the Longmeadow Select Board. His email address is agrant@longmeadow.org.